Original, 16 ft Uncut Black - SHIPS FREE! Original, 16 ft Uncut Beige - SHIPS FREE! Original, 16 ft Uncut Blue - SHIPS FREE! Original, 16 ft Uncut Pink - SHIPS FREE! Original, 10" Pre-cut, 20 Strips, Blue - SHIPS FREE! Original, 10" Pre-cut, 20 Strips, Pink - SHIPS FREE! Original, 125 ft Jumbo 10" Pre-cut Black - SHIPS FREE! Original, 125 ft Jumbo 10" Uncut Beige - SHIPS FREE! Original, 125 ft Jumbo Uncut Black - SHIPS FREE! Original, 125 ft Jumbo Pre-Cut Beige - SHIPS FREE! Original, 10" Pre-cut, 20 Strips, Lime - SHIPS FREE! Original, 10" Pre-cut, 20 Strips, Red - SHIPS FREE! Original, 125 ft Jumbo 18" Pre-cut Beige - SHIPS FREE! Original, 125 ft Jumbo 18" Pre-cut Black - SHIPS FREE! Original, 10" Pre-cut, 20 Strips, Purple - SHIPS FREE! Original, 10" Pre-cut, 20 Strips, Navy - SHIPS FREE! Original, 10" Pre-cut, 20 Strips, Beige - SHIPS FREE! Original, 10" Pre-cut, 20 Strips, Black - SHIPS FREE! 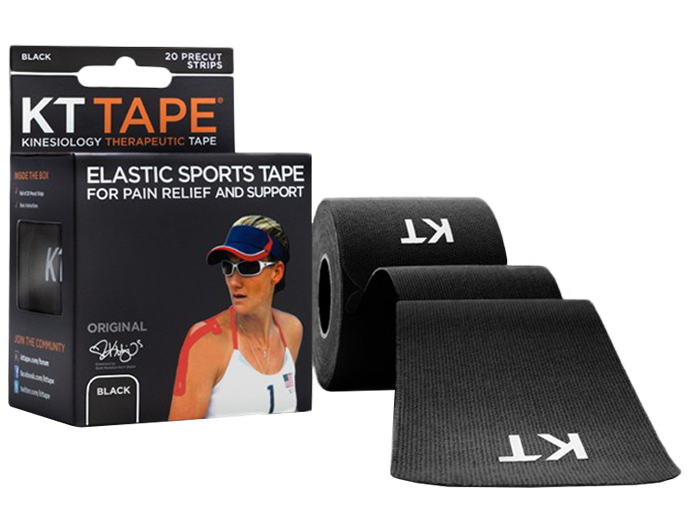 KT TAPE Original Kinesiology Tape supports injured muscles, joints and tendons to prevent overstretching or over contracting. Kinesiology tape also reduces pain by giving structural support and stability without hindering movement so you can still live an active lifestyle. It's ability to support also increases blood circulation to decrease swelling and assist with proper lymphatic drainage so you can recover faster. 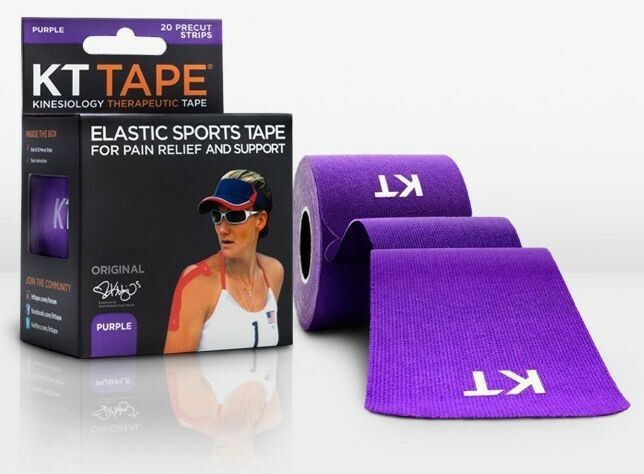 KT Sports Tape is made from natural cotton making it comfortable to wear every day. The material is stretchy and the adhesive is strong to hold up to humidity, sweat and water so you swim and shower. This allows you to get targeted pain relief and wear it during multiple workouts due to is staying power of up to three days. To get the best placement of the tape, always prep the skin so that it's clean and dry. Try prepping the skin with an alcohol prep pad or similar solution before tape application. 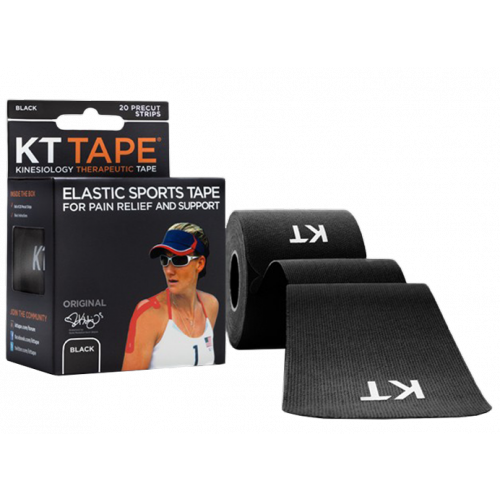 When your workout regimen is intense you need more from your kinesiology tape you may want to try the next level KT TAPE PRO which is made with stronger synthetic fibers that can be worn up to a week. The KT TAPE roll is available in a jumbo roll that's 125 feet for bulk savings when regularly taping athletes before practice or before competition. The 16 feet KT TAPE uncut roll is a great option for an individual athlete who regularly needs support. 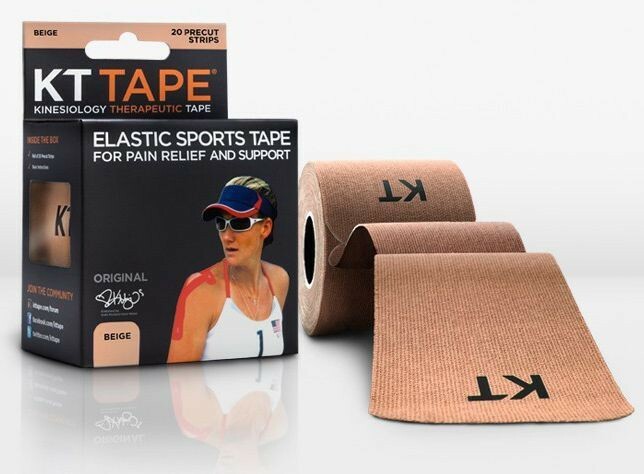 Or they can get the convenience of the KT TAPE precut. This gives you 20 ready-to-go "I" strips that are precut to 10 inch lengths. This not only adds to the ease of application but the corners are rounded to prevent the edges from fraying. Either option, the tape will come in a protective travel case. 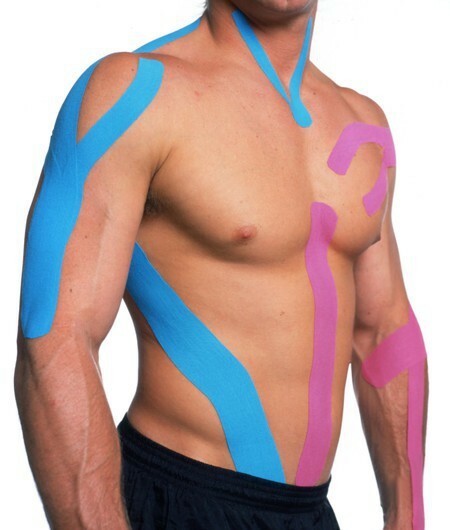 The tape also comes in a variety of colors starting with basic black to bright and vibrant hot pink or lime. For safety when cycling or running at night, the cotton fibers have built-in reflective properties for added visibility. Application: Alleviates pain from target areas and offers structural and muscular support.